The Melting Pot invites you to enjoy more than a meal. We invite conversation, laughter, and coming together over artisan cheeses, fresh salads, savory entrees, and indulgent desserts. If you aren’t really excited about dinner, maybe it’s time you joined us for one-of-a-kind dining at The Melting Pot. 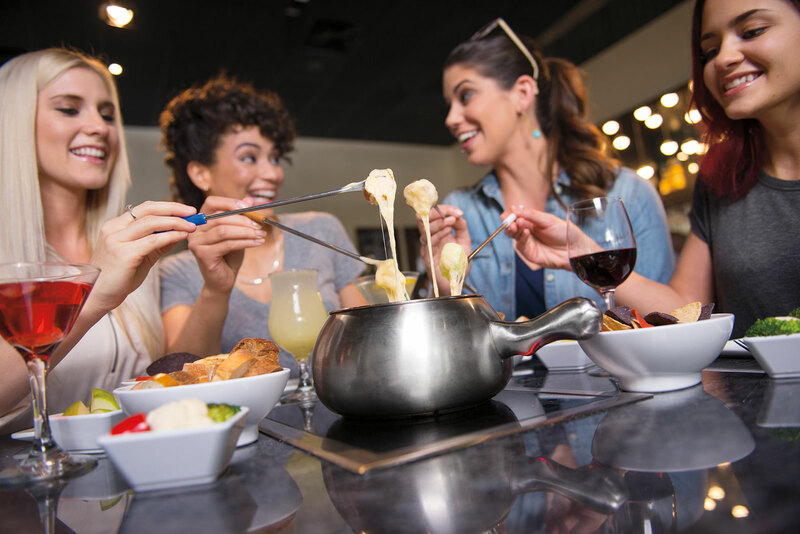 We make any meal stellar by offering you an epicurean fondue experience, featuring an unmatched combination of sensuous tastes you didn’t know you were craving. A night at The Melting Pot is the perfect night out. Here, the dining experience and food are designed around you—you’ll create pairings as unique as you are. Customize your menu however you like, with up to four delightful courses. Pair artisan cheeses and breads with the perfect glass of wine. Indulge in the 4-Course Experience by selecting your favorite cheese fondue, salad, entrée, and chocolate and then choose one of our tempting cooking styles and sauces to enhance the flavor in every bite. Or just stop by to satisfy your chocolate cravings after an evening movie. Of course, we are happy to accommodate any dietary restrictions, with gluten-free options available at every restaurant. Make absolutely any occasion special by meeting up at The Melting Pot—our guests tell us all the time that a no-reason night out can become something to remember. From birthdays to promotions to anniversaries, we celebrate it all by going far beyond the typical dining fare to give you and your guests a great dining experience. Our gourmet fondue restaurant is the place to go to be social and that makes you and your guests as essential to the meal as the food. So gather around the table and unplug, unwind, and truly appreciate the time, while also enjoying a fabulous meal of artisan cheeses, fresh salads, savory entrees, and tempting desserts. Order a craft beer or glass of wine and raise your glass, because it’s going to be a good night. Use our Fondue Timer to let you know when your entrées are ready to eat!